District Managers set goals and plan in a wide range of areas, for example, membership growth, community events, District activities and leadership succession. Planning is important for Region Managers too, although the focus is on supporting District Managers and ensuring State priorities are reflected in local plans. In some States Regions and Districts are required to produce an annual plan, aligned to the State Strategic Plan, and provide mid-year and end of year reports against program goals. The starting point for any plan is to look at where you are now, and the District or Region’s strengths and weaknesses, as well as the opportunities open to you and the threats you may face – a “SWOT” analysis. 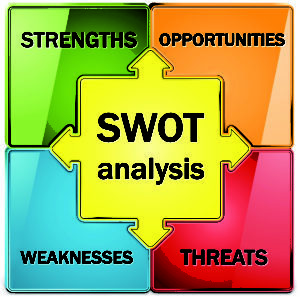 The SWOT analysis groups information into whether they relate to internal factors – strengths and weaknesses or external factors – opportunities and threats. Some States have tools to help you and your Leaders undertake this initial diagnostic task, see the Resources section on your State Website. Your plan should capture membership information, e.g. on the age and number of youth members, new members, exiting members and member progression. Useful data on adult members includes information on youth Leaders, Leaders, Unit Helpers, parent helpers, Leader training etc. Information is also gleaned on special unit events, badges gained, District / Region / State events, community events, fundraising and service activities. Collecting the same data on each unit (or each District) makes it easier to highlight where there are strengths and the areas which may require time and energy to improve. In addition to collecting information about Guiding, it is important to look externally and collect data on the communities in the District/Region, e.g. how many girls of each age group, what are the main and growing ethnic groups, what are the other opportunities (sports, clubs etc.) available to girls and young women, what schools (including specialist schools) are there. As well as this data think about the strengths and challenges the community is facing and how they might pose a barrier to engagement in Guiding or how Guiding can help address them. If a District has three happy units and they only look at the girls in Guiding, they might miss that they’re in a growth corridor with lots of new families moving in and not accessing Guiding. Or that the religious mix of the community is changing and the Guide group that meets in the church hall is not welcoming to the incoming faiths. Or it might that the night or time of the meeting is the same as worship or prayer time or even that a Latvian girls netball team that play on the same night as your Guide unit. Don’t jump to answers but try and think widely about what is going on in your community and where your Units currently fit it. re-energising the Support Group over the next six months. It might not be feasible to address all goals at once and some may take more than one year to achieve. Generally speaking it’s better to make plans in three important areas and achieve them, than 20 plans in every area and achieve none. If you are the Region Manager don’t expect every plan to look the same; each District is likely to have different priorities. Ideally any goals you set should be measurable and include a specific time target. Some goals will be easy to measure, for example, whether or not you hold a District camp biannually will be obvious, but how would you measure re-energising the Support Group? Such a measure might be reflected in numbers attending meetings, volunteers for activities, nominations for roles or achieving a fundraising target. Clear goals make for clear plans. The plans need to include precise activities, with clear responsibilities and time-lines. Most plans will be dependent on some level of resource, not necessarily money, but Support Group and other volunteers’ time, maybe marketing materials or support from State Office. Although each goal will be supported by a plan of activities, events or actions, it’s also necessary to take a ‘helicopter view’ and assess how the plans fit together and complement each other. You also need to ensure there’s not too much happening at the same time and that there are no conflicts with the scheduling of other events. District plans will also need to take into consideration the State calendar. The calendar for each year is usually established in Term 3 or 4 of the previous year, so planning at District level can ideally slot in smoothly as you receive this information. Any plan should be reviewed regularly, not only to see how you are doing, but also to identify any opportunities to share learning and celebrate success. Ideally the planning process should become part of your annual cycle with your team, starting late in Term 3 or Term 4, so the plan is fully developed for the start of the next calendar year. As well as this strategic planning to meet goals, you’ll be engaged in planning activities, events, District meetings and AGMs. It might be helpful to put together a schedule of the major tasks every year to act as a backbone to your plans. Set out below is an example timeline for District Managers. The assessment of where you are and the setting of goals is a team event. All Leaders as well as the Support Group should be fully involved. Assessing where you are, having a full discussion and setting goals might be a process which takes several meetings spread over a term. If you are putting together a District plan the oversight and challenge of the Region Manager can be very helpful in refining the plan. From a Region Manager perspective reviewing the District plans enables you to see if there are any common trends and to potentially identify ideas for meeting agenda items or training sessions. As the Region Manager you might appoint a Region PR, Development or Marketing Consultant to provide advice to your District Managers and Leaders. You could put together a team to support your marketing activities, for example, a volunteer to prepare media releases, another to organise community displays and someone else who is a dynamic and inspiring public speaker.